Cleaning out your basement or garage? 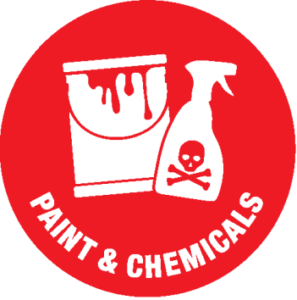 Got old paint or chemicals? We collect Household Hazardous Waste from District member community residents by appointment only at our Georgia Recycling Center year-round Monday-Friday. Call (802)524.5986 with questions or to schedule an appointment. Fees apply for many items. Payment by cash or check only. PaintCare is a paint industry supported program. Many hardware stores participate in the program and will accept unused paint at no charge. Click here to go to PaintCare’s Drop-Off Location locator and find a participating store near you. Same as items accepted at Georgia Recycling Center. Please see top of page for list. Note: No businesses or large loads at HHW events; please call (802)524.5986 for an appointment at our Georgia facility. Small loads only at events. Large loads may be rejected. Fees apply for many items. Payment by cash or check only. HHW collections are open to any resident of our member towns.